Brilliant design and excellence are always a priority for Tag Heuer timepieces. But their prestige isn’t gained from their stylish appeal alone. Watch-wearers flock to them for their dependability. A man should never have to sacrifice function or fashion for each other, and the Link Men’s Watch CJF2115.BA0594 is a Tag Heuer that can give them both! This watch is a chameleon for any type of guy out there. It will play up or tone down and be suitable to both the trendies and the easy-goers. Its smooth lines, uniform stainless steel, and chronograph dial are only the first features that you notice. 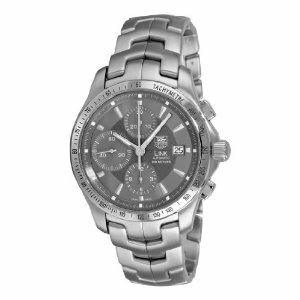 The bezel has on it a tachymeter scale for precise time. Next to 3 o’ clock is a date display window as two silver-toned hands, plus a second hand, tick over it; all upon a gray dial. The three sub-dials of the chronograph series are on the top, bottom, and left hand side of the watch face. Owners of this watch are always pleased with the overall finish and look; everything from the size to its “bonus” characteristics. The bracelet doesn’t pinch and although it looks like it may be heavy, it turns out not to be a burden for most. Reliability was never an issue either, as it was accurate with the time too. Even with tax and shipping fees, Amazon.com offers you this watch at the lowest price of $2,290.00. Other top sites selling the watch close to this price are Jomashop.com for $2,660.00 and PrestigeTime for $2,520.00. A comparable watch to this one is the Tag Heuer Men’s CJF211A.BA0594, which has very similar features aside from its black dial. The CJF211B.BA0594 is the silver variation, and it has a much lighter gray watch face compared to the CJF2115.BA0594 slate-gray color of the dial.